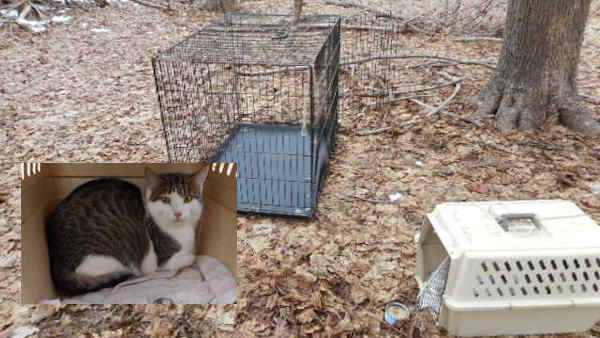 PATCHOGUE, Long Island (WABC) -- The Suffolk County SPCA is offering a $2,000 reward for information leading to the arrest of the individual(s) who abandoned a mother cat and her four dead kittens in a wooded area in Patchogue. A resident walking in the woods spotted the travel carrier containing the five animals on a deserted path near Grove Avenue between Newins and Smith streets. Suffolk County SPCA Chief Roy Gross said the mother cat had been well cared for and was not feral. It was not clear how or when the kittens died. The carrier had the initials "TOH" on it, and investigators are looking into the case. Anyone with information is urged to contact the SPCA so that those responsible can be brought to justice. Abandonment of a companion animal is a misdemeanor animal cruelty charge that is punishable by imprisonment and/or a fine. The mother cat is being fostered and will be available for adoption. Anyone with information is asked to call the Suffolk County SPCA at 631-382-7722. All calls will be kept confidential.